Thanks to smartphones and other types of mobile devices, we're more connected to the world around us than ever before. This certainly has both its advantages and disadvantages. On the one hand, it's never been easier to get more done while on-the-go. You can be just as productive in your office as you can be halfway across the globe on vacation. On the other hand, this can lead to a definite feeling that "switching off" is impossible - especially when you consider that according to one recent study, 61% of people check their phones within five minutes of waking up in the morning. From a certain perspective, this makes a bit of sense - after all, if you want to get as much done in a day as possible it stands to reason that you should check those emails that piled up overnight as soon as you can, right? Well, not necessarily. There are some compelling reasons why you should STOP checking your email first thing in the morning, especially if you're concerned about productivity. The main reason why you should stop checking your emails right when you wake up in the morning is that you're doing a lot more harm than you are good. According to one study, 66% of people say that the first thing they do in the morning is either A) check their email, or B) listen to their voicemail. So don't worry - you are hardly the only person out there making this mistake. To understand why this is such a problem, consider the fact that according to Forbes the average person checks their email roughly 15 times per day. When people limited their checking to just three times per day, however, their productivity increased, and their stress levels decreased. Part of the problem is that when you check your email, you're at the total will of whatever messages you find. Everything else gets moved to the back burner. It's also particularly stressful if you're waiting for a reply to an important email that hasn't arrived yet. 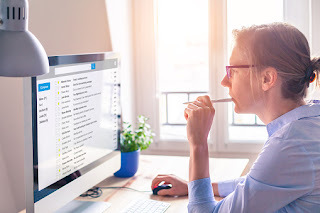 By both limiting the number of times that you check your email throughout the day AND by making sure that it isn't the first thing you do in the morning, you're in a much better position to get your day off on the right foot. You're beginning your day in the most stress-free way possible, giving yourself a little breathing room to contextualize your priorities and lay out the day ahead without distraction. These are just a few of the many reasons why you should STOP checking your email first thing in the morning. Yes, the instinct to try to get as much done in a day is a strong one - especially for a career-driven professional such as yourself. But you need to understand that you are quickly reaching a breaking point - "diminishing returns" doesn't even begin to describe it.